On behalf of The Society of Dyers and Colourist Education Charity, I am honoured to invite you to attend SDC EC’s Colour Event 2018. The event is a lecture series and award ceremony. 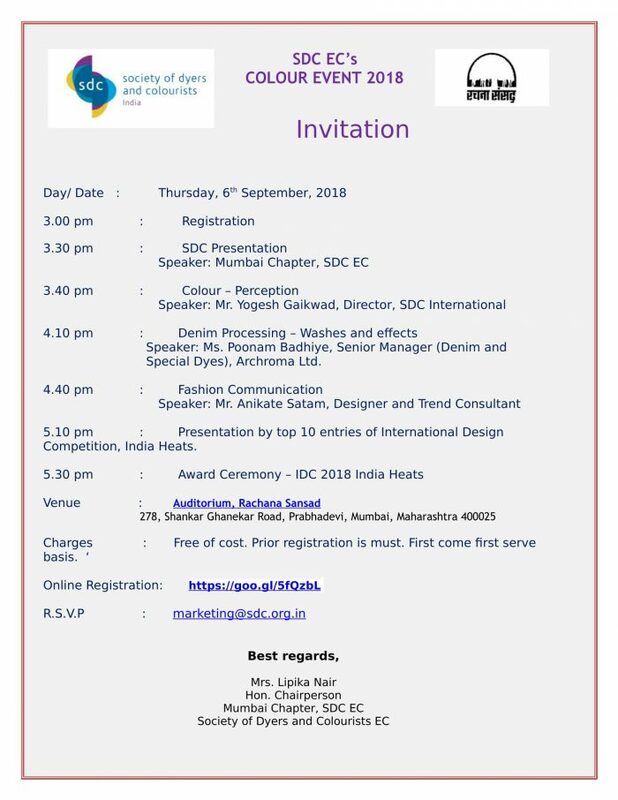 The technical seminar will be followed by an announcement and felicitation of the winner of International Design Competition 2018 – India region. 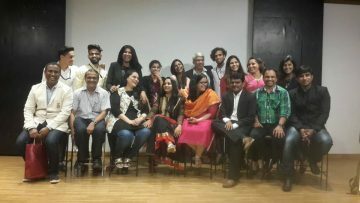 The event is jointly organised by Mumbai Chapter, SDC EC and Rachana Sansad, Prabhadevi. The Seminar features three distinguished speakers and will talk about Colour, Denim Processing and Fashion Communication. The top 10 entries will share their experience about the design competition and their boards. Invitation is attached with this letter. The Society of Dyers and Colourists (SDC) is the world’s leading independent, educational charity dedicated to advancing the science and technology of colour worldwide. An educational charity in its own right, SDC EC, India, is the largest overseas region. Over the past 10 years, SDC-EC has successfully organized conferences and seminars which have been well received by the industry for their technical content. These International Conferences create a common platform for information dissemination, global networking, bringing together national as well as global talent for the common good of the Textile Supply Chain.